Courtesy of Michael Kenny. Upper photo of Nadine Bennett courtesy of Catherine Desmarais in Lac Meech, Quebec, Canada. Lower photo of Amy Ross. Fly over Canada during the winter months and the snow beautifully lies over the country like a soft white blanket. Fly over Canada during the summer and the greens of the countryside and the blues of the lakes and rivers show a dramatic transformation of color. But it took Paul Duffield to kick start ice swimming in Canada. Back in December 2012, Duffield completed the first Ice Mile in Canada, swimming 1.08 miles in 36 minutes 50 seconds in 4.33°C water in Lake Okanagan [see below]. 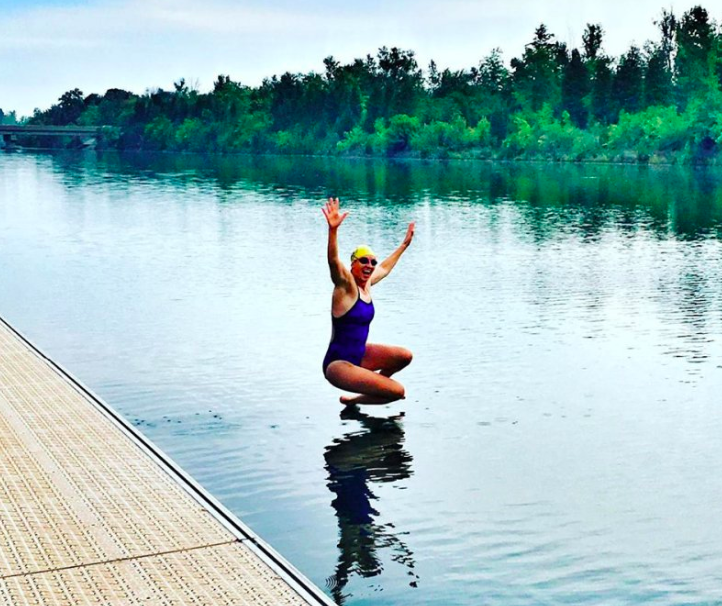 Michael Kenny reported on the next stage of Canadian ice swimming when most recently Nadine Bennett, Amy Ross, and Katharine Borczak did the first certified Ice Miles by Canadian women. Bennett has done 3 Ice Miles. 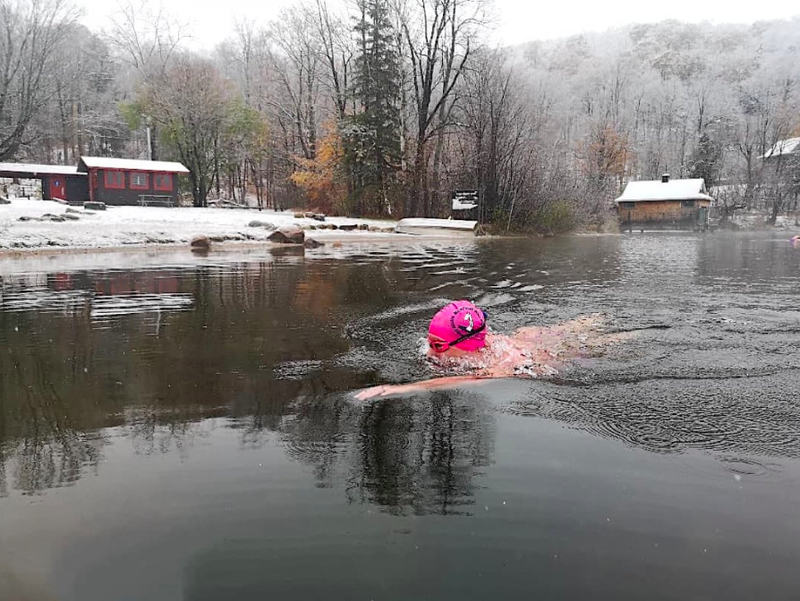 Her first Ice Mile was done in November 2018 in Lac Meech, Chelsea, Canada in 4.53°C water and -14.00°C air, she completed an Ice Mile in 41 minutes 31 seconds. Two weeks later, she did a second Ice Mile in JD Memorial Park, Mississauga in 4.10°C water and 6.00°C air in 33 minutes 45 seconds. A week after that, she completed her third Ice Mile in Kellys Beach, Prescott, Ontario in 3.93°C water and 4.00°C air in 34 minutes 49 seconds. Ross did her Ice Mile in November 2018 in Coronation Park (GLOW Beach), Oakville, Ontario in 4.43°C water and 3.00°C air in 36 minutes 21 seconds. Broczak did her Ice Mile in November 2018 in Lake Ontario, Mississauga in 4.10°C water and 6.00°C air in 39 minutes 24 seconds. Kenny conducted an extensive Q&A with the trio of Ice Milers here called Canada's Ice Queens.